Ever feel like something is missing in your life and you are ready for something more? Ever wondered what it really all means underneath? Or wish that you could understand better what makes you (and others) "tick"? Come and join us in a journey of self-discovery as we explore how our life experiences have shaped us into the people that we are today. 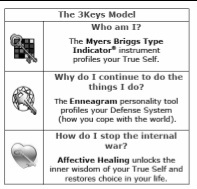 Workshop participants will receive an overview of the 3Keys Model for deep emotional affective healing, and a working understanding of the MBTI and Enneagram personality systems, including the roles of these two typing systems in the development of both the core self and defense systems. The retreat will include experiential exercises, group process and discussion to move participants through their own process of self-discovery and explore how this wisdom can heal emotional and spiritual wounding, and how you can use this wisdom to guide you back to your soul self. Want to know why you continue to do the things you do even though they may not work for you? Want to learn more about who you were really designed to be? Do you ever feel like there is a war inside between what you want to do and feel like you should do? Attend this workshop for an opportunity to learn more about your internal conflicts and begin the journey back to your soul self! This workshop is based upon the Three Keys approach outlined in Pat Wyman's book "Three Keys to Self-Understanding: An Innovative & Effective Combination of the Myers-Briggs Type Indicator Assessment tool, the Enneagram, and Inner Child Healing". This approach combines the best elements of various healing disciplines, including affective therapy, MBTI, the Enneagram, guided imagery and meditation practices, Neuro-Linguistic Programming technique (NLP), Emotional Freedom Technique (EFT), coaching and bodywork. This workshop is offered periodically throughout the year by Transformation Counseling, LLC, and can also be sponsored by other organizations or groups. The Three Keys workshop length and emphasis can be adjusted to fit your group's needs.